In a November 2018 post, I discussed Jeff Sessions' immigration accomplishments as attorney general (AG). In that post, I particularly noted Sessions' use of his so-called "certification" authority to create precedents, and thereby craft policy, in immigration law. 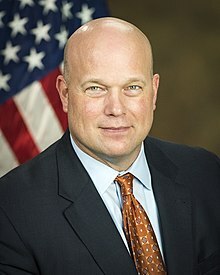 It appears that his acting successor, Matthew Whitaker, is picking up where Sessions left off. On December 3, 2018, Whitaker referred the Matter of Castillo–Perez to himself for review. Based on the questions that the acting AG is asking the parties and interested amici to brief, at issue in that matter is the effect of multiple drunk driving convictions on applications for cancellation of removal for certain nonpermanent residents under section 240A(b)(1) of the Immigration and Nationality Act (INA). In connection with an application for cancellation of removal under [section 240A(b)], what is the appropriate legal standard for determining when an individual lacks "good moral character" under [section 101(f) of the INA]? What impact should multiple convictions for driving while intoxicated or driving under the influence have in determining when an individual lacks "good moral character" under [section 101(f) of the INA]? What impact should multiple such convictions have in determining whether to grant discretionary relief under [section 240A(b) of the INA]? By way of background, cancellation of removal and adjustment to permanent resident status under this provision (also referred to as "42B" after the application form number for that relief) is available to an alien who is inadmissible or deportable from the United States if the alien has been physically present in this country for a continuous period of not less than 10 years prior to filing that application, "has been a person of good moral character" throughout that period, has not been convicted of specified criminal offenses, and establishes that his or her removal "would result in exceptional and extremely unusual hardship" to a qualifying relative or relatives. Even if the alien satisfies these requirements, an immigration judge can still deny the application in the exercise of discretion. "Good moral character" is defined in the negative in section 101(f) of the INA, that is to say that this provision actually identifies aliens who do not have good moral character. Included on this list are habitual drunkards, those who have derived their income principally from illegal gambling activities, certain criminals, individuals who have given false testimony, aliens who have been confined as a result of convictions for 180 days or more, and aliens convicted of aggravated felonies, as well as Nazi persecutors, aliens who participated in genocide, those who have committed acts of torture or extrajudicial killings, and aliens who have committed severe violations of religious freedom. That provision is also open-ended, however, stating: "The fact that any person is not within any of the foregoing classes shall not preclude a finding that for other reasons such person is or was not of good moral character." Often, there is a balancing test in applying discretion between the hardship to the qualifying relative and the negative factors relating to the applicant under consideration. Although there have been various bills that have proposed making driving under the influence (DUI) of alcohol or driving while intoxicated (DWI) grounds of inadmissibility or deportability, none have been adopted, and DUI and DWI convictions do not otherwise render an alien removable. This particular form of relief, 42B, is extremely generous, in that it grants a green card to an alien illegally present the United States. Given the generous nature of this particular benefit, it is appropriate that due consideration be given to DUI and DWI offenses, given the potentially dire consequences of those offenses. It is also good to know that the administration's use of the valuable certification tool to craft immigration policy did not end with the resignation of Jeff Sessions.